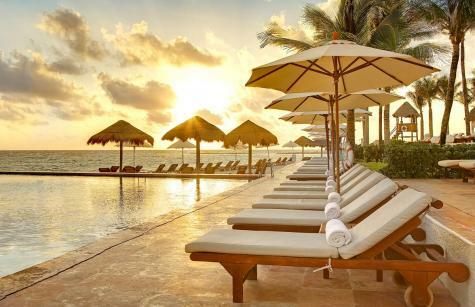 Visitors seeking a relaxing beach vacation will delight in Cancun’s unparalleled tropical beauty. Most famous for its long white sandy beaches, stunning turquoise waters and vibrant nightlife, Cancun also boasts a rich history and breathtaking archaeological sites. Explore ancient Mayan ruins, traditional Mexican villages, and impressive eco-parks. Enjoy a range of activities including championship golf and water sports. Enjoy a 5-night stay in a deluxe ocean view guest room including daily breakfast for two at this beachfront property. Lounge at the resort’s private white sandy beach and four pools. Situated just steps from the world’s second largest coral reef, this is one of Cancun’s best spots for snorkeling and scuba diving. Additional world-class dive sites and snorkeling are found in the nearby islands of Cozumel and Isla Mujeres. Play tennis or work out at the fitness studio. Treat yourself to a massage at the Heavenly Spa by Westin™ or venture beyond the resort for championship golf, including Jack Nicklaus signature championship Moon Palace Golf Course. At the end of the day, enjoy Cancun’s vibrant dining, shopping and nightlife.